When my wife and I were shopping for our home, we hoped to find a place to create an outdoor sanctuary; where we could relax on the weekends, enjoy a little peace and quiet with friends, and plant a small flower garden. What we didn’t realize was that we would easily get these benefits and much more by making our yard more inviting to wildlife. We soon realized that the sanctuary we really needed was a wildlife sanctuary. To make your yard a welcome respite for all kinds of wildlife, begin by simply considering survival basics. All creatures require similar provisions for their physiological needs, primarily food, shelter and water. Keep in mind that these are year-round requirements. Take cues from parks and other natural spaces in your area to gain inspiration. Plant selection should be chosen in large part from locally native species, so that your local wildlife will be sure to recognize them as habitat. Because the principles of design do not change, you can easily adapt this “wild landscape” to fit your style and pallet. There are several ways that you can provide food. The most straight-forward is by providing feeding stations. You can buy or build feeders for dozens of types of wildlife including birds, butterflies, squirrels, deer, and more. A good strategy is to provide feeders for those types of animals or birds that you most appreciate seeing on a regular basis, and placing the feeders in highly visible locations. In most cases, the food you provide will supplement, not replace, their natural food sources; although your feeders may become more important in a harsh winter. Another, and possibly more important, way to feed wildlife is by planting food plants in your landscape. For small creatures, like birds, butterflies and bees, offering host plants can make a big difference. You can learn the best habitat plants for your area by connecting with your state Department of Natural Resources, or your local nursery. As you plan your yard’s transition to a neighborhood wildlife sanctuary, choosing variety is the key to providing year-round habitat. Add different plants that become most beneficial at different times of the year. Some species are useful to one type of creature for lush edible foliage, another when in flower, and another when the fruit ripens. Bees and butterflies require nectar from early spring through late fall, so a continuous supply of flowers is imperative. A cozy home is an easy provision for wildlife in your backyard wildlife sanctuary. Leave a patch of tall grass and weeds along a fenceline for beneficial insects and other invertebrates to call home. Plant evergreen trees and shrubs for birds to build nests. A small section of rotting log, a flat bottomed rock, an upturned clay pot; these are great places for small reptiles and amphibians to take cover. 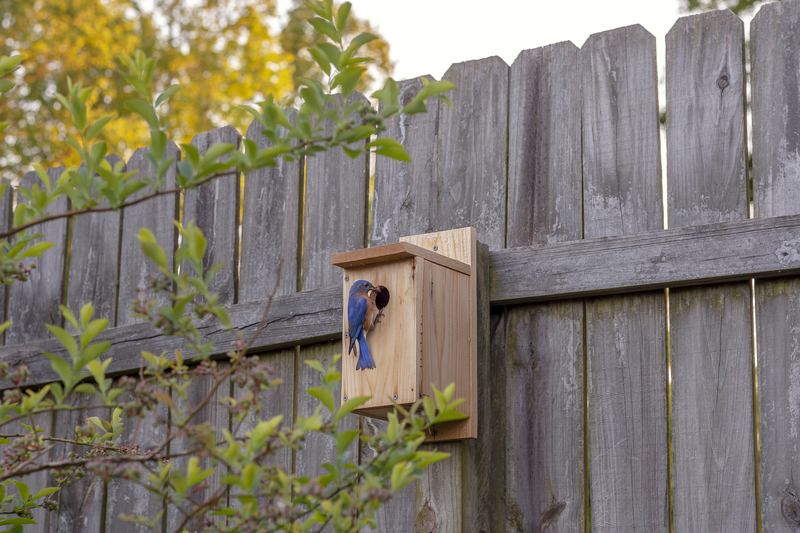 Provide nesting boxes for cavity-nesting birds, like bluebirds. Bat houses offer much needed roosting and nursery space for these helpful flying mammals. If you live near a small trickling stream, this may provide all the water necessary for your neighborhood wildlife needs. But, if you want to make your landscape irresistible to all kinds of critters, add a small, trickling water feature. The trickling sound is a key attraction, as curious birds and other animals will come just to check out the sound and be wowed by the rest of the features in your backyard wildlife sanctuary. Setup a simple bird bath with a small fountain pump to recirculate the water and add just enough noise. For a more ambitious project, build a pond with a stream and waterfall for an even bigger attraction that can host fish, amphibians, and more. The sound of the water can also act as “white noise” to block the sound of traffic or other undesirable neighborhood noise. As mentioned above, your garden style can be personalized, but to provide the greatest wildlife value there are a few elements that you should include. Species diversity. The most valuable wildlife habitats include trees, shrubs, grasses, annuals and perennials. Division of space. Group plants with similar needs into the same beds regardless of the type of wildlife they support. Avoid planting “theme” beds for particular wildlife species – like “hummingbird garden” or “butterfly garden.” Instead, intermingle sun-loving, or shade-loving plants for butterflies, hummingbirds and other wildlife. Low maintenance. Steer away from most herbicides and pesticides, as these can cause harm to the very creatures you have invited to your landscape. Allow seedheads to remain on plants after flowers have faded, as these become food sources. Leave some unmowed, untrimmed areas for beneficial insects, birds, reptiles and other diverse species. Use pruned branches to create brush piles for added shelter, or grind them up for mulch that can be used on garden paths. Garden art. Consider the value of feeders, nest boxes, birdbaths, and other habitat elements for both wildlife and people. Animals seldom care about architecture or color pallet. Include these elements in a way that is functional for them and enjoyable for you as well. With the addition of a few elements of hospitality for wildlife, that peaceful backyard sanctuary you’ve always wanted can be yours. Take a look at some tools that will help you transform your yard into a wildlife sanctuary, click HERE. Want to create an outdoor sanctuary where we can relax on the weekends and enjoy a little peace by making our yard more inviting to wildlife? Find out here!